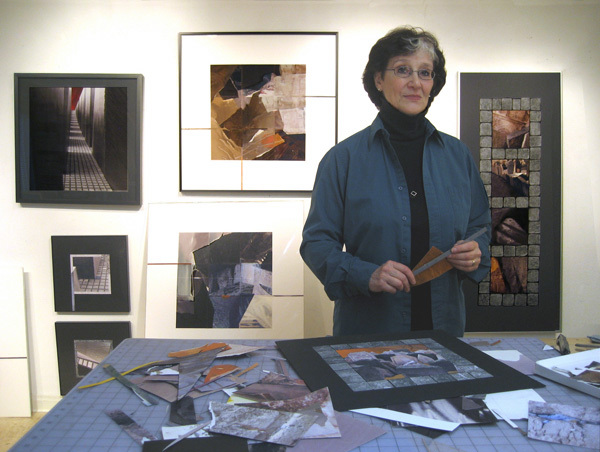 Florence Weisz has exhibited her art in the US and abroad. Her one-person shows have been at the Newark Museum, the Jersey City Museum, the New Jersey Center for the Visual Arts, the Pierro Gallery of South Orange at the Baird Center, Kent Place Gallery, Barron Arts Center, Johnson & Johnson World Headquarters, Chubb Corporation Gallery, John Harms Center for the Arts, the Fairlawn Library Gallery, Fairleigh Dickinson University and New Jersey City University galleries. Weisz's work has been included in group exhibitions at the New Museum of Contemporary Art, Studio Museum of Harlem, Franklin Furnace, BACA Downtown, Pfizer Headquarters in New York, Katonah Museum, Mangel Gallery, Philadelphia, and the Reading Museum, in Pennsylvania; throughout the State of New Jersey including Aljira Gallery, City Without Walls, Walsh Gallery at Seton Hall University, Monmouth University Galleries, Tweed, Rabbet, the Printmaking Council, AT&T, Bell Labs, Nabisco, A.J. Lederman galleries, and the Morris, Monmouth, NJ State Museum, Trenton City, Jersey City, Bergen, Newark and Princeton University Museums. Her paintings are in the collections of The New Jersey State Museum, IBM, The Port of Authority of NY and NJ, Citibank, Warner Lambert, Schering Plough, Gibraltar Securities, City Federal, Depfa Bank, Ciba-Geigy, Marriott Hotels, The University of Pennsylvania Hospital and E.I. du Pont de Nemours. She has completed site-specific commissions for private homes, corporate and public spaces including, Chubb Insurance, PSE&G, Centocor, Merck Sharp and Dohme, Schering Plough HealthCare Products, Three Stamford Plaza and the Municipality of Beer-Sheva, Israel. Florence Weisz studied in Paris and Jerusalem after earning a degree in Fine Art from Douglass College, Rutgers University. She is a recipient of a New Jersey State Council on the Arts Fellowship Award. Paper collage is my primary medium. Over the years I have explored many visual ideas seeking distinctive materials and innovative ways to express them. My "Organic Grid" and "Color Grid-Revisions" series are composed using alcohol ink infused papers (see alcohol ink techniques below). The flowing forms created are integrated within a geometric grid format. I also combine the alcohol inks with my digital photos for collages in my "Stones of Resonance" series: China and Jerusalem are abstracted imaginary landscapes — Prague, Berlin and Tibet are more realistic photo-based compositions. The "Sensuous Stripes" series stem from my fascination with rigid patterns of parallel lines and how they become undulating and sensual when draped on the human body. These stripe collages have evolved into 3-D abstractions and site-specific installations. I investigate the blurry line between collecting and hoarding by including actual objects in a series of assemblages titled "Cautionary Tales." I have found great therapeutic value in creating art about my knee surgery and my experience with Bell's Palsy through two series called "My Left Knee" and "My Left Face." The unique papers, my major source for collage material, are the result of an original technique I've developed over many years. My art originates with the spontaneous and largely uncontrollable act of pouring and splashing alcohol-based inks onto absorbent, unsized etching paper (Copperplate Deluxe). I begin this process by clipping the four corners of the paper (42 x 30 inches) to a cradle-like device hung by chains and a swivel from my studio ceiling. The paper is suspended horizontally leaving my hands free to pour the inks (pigments dissolved in alcohol) and resists (water and/or gesso) onto the top surface of the paper while moving and tilting it. The inks saturate the paper at different rates, emerging on the paper's underside as unpredictably blended colors, textures and abstract shapes. I compose my collages intuitively, piece by piece, cutting and tearing from a 35-year collection of these papers, some still whole, many just scraps of different sizes. I never throw anything out, assuming that each remnant might be perfect in some future artwork. I use either the "poured side" showing the ink sediment mixed with resists or the "smooth side" showing vibrant and subtle veils of color, transparency and opacity, and what appears to be soft or sharp focus.